TIGHT FIT "THE LION SLEEPS TONIGHT"
This 80's hit was actually a cover version of the song by Solomen Linda and The Evening Birds which was originally released way back in 1939. Also, in 1961 The Tokens had a #1 in the U.S. with their version and the song has been covered by numerous artists since using more or less the same lyrics. The most well known version in the UK, of course, was by Tight Fit who were #1 for three weeks from 6th March until 26th March 1982, when it was pushed down to the No.2 spot by Goombay Dance Band's Seven Tears. 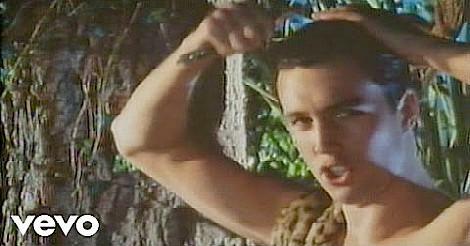 Tight Fit also prevented Toni Basil from reaching No.1 with "Mickey" for two weeks. In 1981, the act was a group of session singers and scored two hits with Back to the 60's and "Back to the 60's Part 2" which were both a medley of 60's hits. 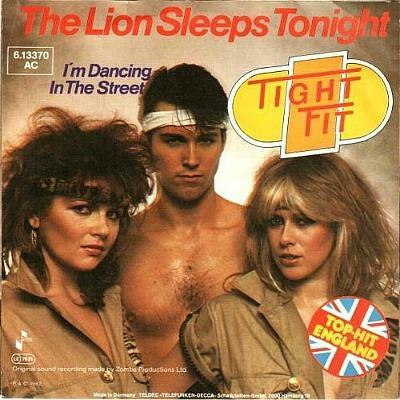 However, for The Lion Sleeps Tonight in 1982, Tight Fit had become a trio with two female dancers and a male, lip-syncing model as the frontman, although different session singers actually sang on the record. Tight Fit had two hit singles in the 80s, with the Abbaresque Fantasy Island being the trio's second hit and reaching #5 in the UK. Tight Fit had several line-ups, but for the two hit singles they were Steve Grant, Denise Gyngell and Julie Harris. When the trio released their self-titled debut album, the two girls left the band, apparently claiming they weren't receiving any royalities. The album flopped at #87 and the third single Secret Heart failed to break the Top 40, peaking just outside at #41.